Do you suffer from heel pain, also known as Plantar Fasciitis, during or after playing sport or first thing in the morning? Are your shoes causing your plantar fasciits? Are you a Liverpool supporter? (I’m not, unfortunately, I’m Chelsea). Then you’re not alone, I read with great interest an excellent article in The Irish Independent on 5/12/15 by Chris Bascombe on Liverpool Captain Jordan Henderson’s struggles with Plantar Fasciitis, he says “It was unbearable, every time I planted my foot it was like a burning, stabbing pain”. Even the mighty Alex Ferguson commented in his book that Jordan’s poor running style would make him injury prone. In a related RTE Sport interview The Munster & Ireland Rugby player Damian Varley, emotionally described his decision to cut short his playing career due to Plantar Fasciitis. Varley: Not Everyone Has A Fairytale Ending read the story here. What is undeniable, is that Plantar Fasciitis is at best a nuisance and at worst debilitating & excruciating. I’m not going to go into a long explanation of Plantar Fasciitis and its anatomical cause, you can Google that yourself. However, the interesting thing I noted from the Jordan Henderson interview was him linking his change of boots and a fractured metatarsal bone last season as a catalyst, related to a change in his training schedule as a possible cause. I have personal experience of both these contributory factors. I’ve worn the same style & brand of shoes for years. However, last year after wearing a new pair of shoes for only a few days I was crippled with heel pain, the plantar fasciitis had returned. I also enjoy a good workout so last year while on holidays in Kerry I decided to use the leisure facilities. I must have got a bit carried away with myself as I increased the incline on the treadmill to 10 , I think it had actually been going downhill initially!! I was immediately struck with the same problem, plantar fasciitis (how dare it attack me, I’m a Podiatrist !!) Cure thy self, I hear you say, so I did. I alternated my shoes. I changed my shoe orthotics & got real with the treadmill until I worked up to the realistic 5 incline & did specific plantar fasciitis stretching exercises. If all else fails, then come to see us. Believe me, we understand your pain. We have a wealth of experience in dealing with plantar fasciitis clients as it one of the most common complaints we see. Our experienced podiatrists will give you some useful advice, if required prescribe some orthotics or insoles, use ultrasound or perform acupuncture. 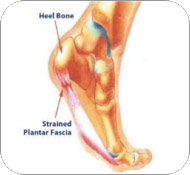 Plantar fasciitis is manageable, you do not need to suffer in pain from this condition. With the right advice and corrective measures, you can get back to enjoying a pain-free life.